Now is the point where I should probably do an August favourites, but because I haven’t had much of a chance to try new products, and I don’t want to repeat my favourites from July, I thought I’d do something different. I’m going to post some of my wishlist so you can see what I’d like to try next. 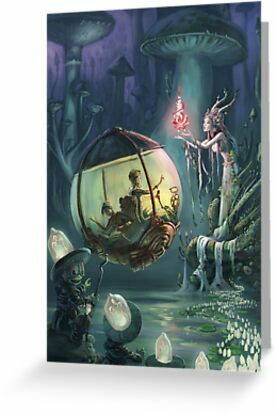 First of all is a selection (of the many) greetings cards I like from Redbubble, I like this website because artists can sell their work on a variety of products from t-shirts and leggings to phone cases and stickers. 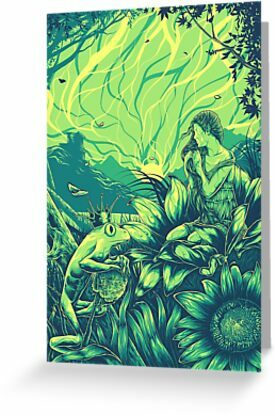 This is ‘The Frog Prince’ by Eggzoo and costs £1.47, I just love how the image is made of shades of green but still has real depth and beauty. The second choice I made is ‘The Sleepers in That Quiet Earth’ by Jenny Fontana and is £1.26. This one won’t let me post the image so here is the link. I like this image because it has cats in it (obviously), but there’s also something sad and beautiful about it. The last card I’d like to buy is ‘The Mushroom Fairy’ by Emil Landgreen and is £1.30. This image reminds me both of fantasy books I read when I was younger and video games that I like to play today. I just think it’s a magical image and I love it. The next few items are decorations for the house, the first is this beautiful blue recycled glass vase, the shape is so unusual and I think it’s a quirky item to have at home. It’s from Habitat and costs £25. I can’t post an image so here is the link. The next two items are from Tiger, you can’t buy from this store online so you may or may not find these in store. The first is this ‘cloud storage’ which is £5 for a pack of 2, I just think it would be so cute to have little cloud shelves for my books and knick knacks. The second is this pretty teapot which is also £5, I don’t drink a lot of tea but I think that this teapot and a tray of cucumber sandwiches would make a lovely lunch. 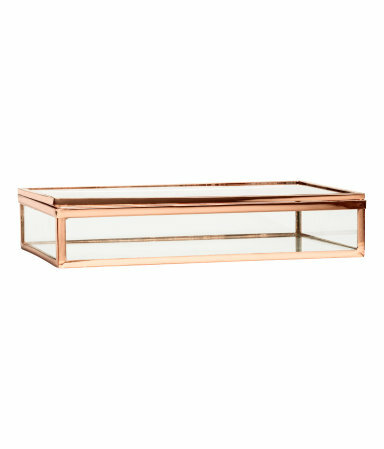 The last shop I’d like to buy home wares from is H&M, I’d quite like to have this large glass box in bronze, which is £14.99. I think it would make a great display for my jewelry. 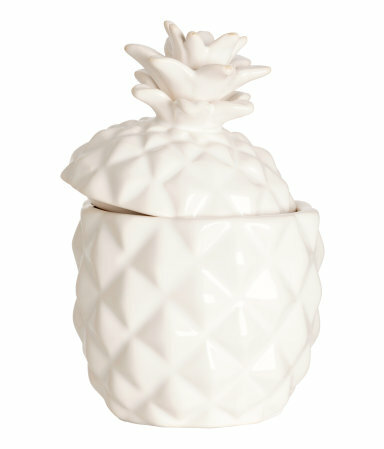 The last item I’d really like is this pineapple candle, which is £4.99. It’s simple, quirky and I quite like pineapples so I think it’s great. I like how you can replace the top of the pineapple when you’ve finished burning the candle and it just becomes a lovely decoration. Now on to books, I’ve picked up a few items from my book list recently but there are always more. These are all from Amazon. 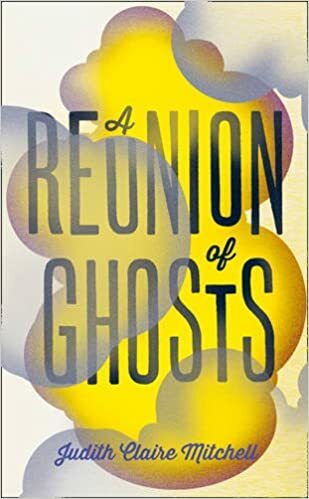 The first is ‘A Reunion of Ghosts’ by Judith Claire Mitchell, it’s currently retailing at £11.99. The book looks to be both beautiful and haunting so I think it will make an absorbing read. 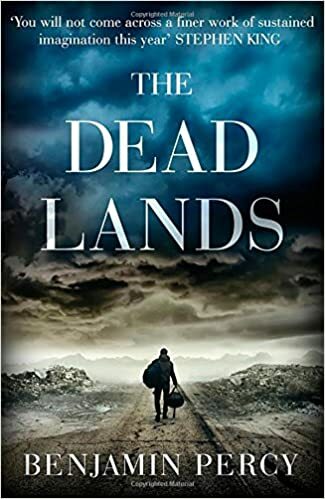 The second book is ‘The Dead Lands’ by Benjamin Percy which is retailing for £15.58, this book is set in the post-apocalyptic American West. From the description I think the book will be enthralling and I haven’t read any other books from this genre so it could be a nice change. 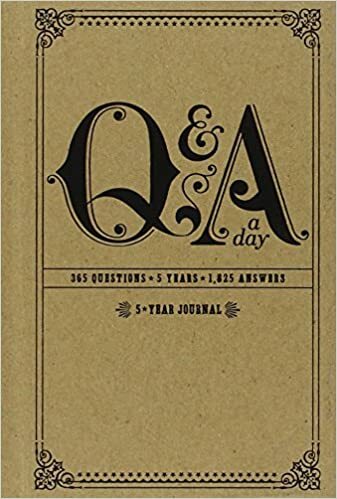 The last book, well it isn’t really a book, it’s a 5 year diary with a question for you to answer every day. The interesting thing about this diary is the questions are the same for each year so you can really see what’s changed and what’s stayed the same. I can’t really imagine what life will be like when I’m 30 so I’m excited to keep track of my journey! It retails at £12.94. With the food I decided to pick things from brands I haven’t tried yet, because after each review I say if I want to try other products from their range. The first couple are from Holland and Barrett, one is the 50g Cocoa Libre milk chocolate orange bar which is £1.99. I can’t post an image so here is the link. I love orange chocolate so I can see myself munching on this bar in the near future. The other product is The Foods of Anthenry cookie shots brownie 120g which is £2.95 for a pack. Again, I can’t post an image so here is a link to the product. These sound like they are really chocolately and would make a nice treat, or something to have with a cup of tea or hot chocolate. The next product is the 40g Lovechock organic pineapple and Incan berries raw chocolate bar which is £2.69. This is such an unusual flavour combination that I have to try it, also they say that the bar is full of ‘love chemicals’, so that’s interesting. The next product is from Tyne Chease, it’s their garlic and herb variety and it looks amazing. The price is a bit steep at £9.95 but it’s a handmade artisinal product and looks to be of high quality and taste. The next couple of products are from VeganTown, I found it hard to pick just two because I want all the chocolates on there! The first I picked is the Ananda’s round up (a vegan Wagon Wheel) which is £2.49, I haven’t eaten a wagon wheel in years but the idea appeals to me so I’d really like to try one. The second product I chose was the Jokerz candy bar (vegan Snickers) which is £1.94. I loved Snickers bars when I was vegetarian, and anything with peanuts in it is a winner for me. Also, as a bonus I would love to try any of the Ten Acre popcorn and crisps, they all look so delicious! While I have quite a lot of cruelty free beauty products there are still a few items which I need to switch so that I have a completely cruelty free make-up bag. 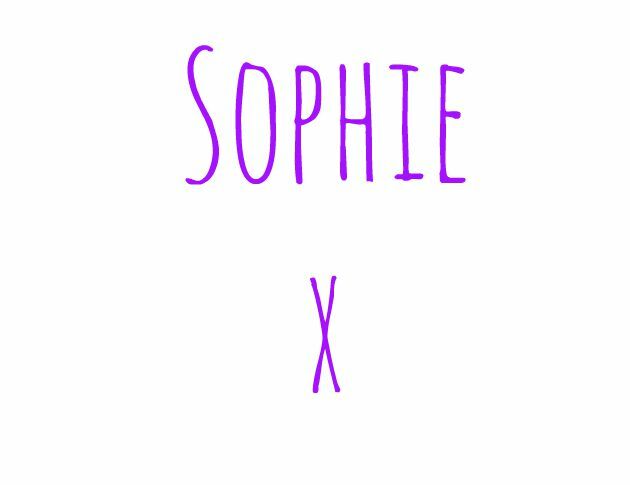 There’s also products which I’d like to start using and certain products that I’d like to give a go, hoping to replace my original cruelty free products. The first product is GOSH BOOMbastic black mascara, which is £8.49, this is a little expensive but it seems like a great product and has quite a few good reviews so I’d like to see what it can do for my lashes. The second product is B. Groomed eyebrow kit in blonde, which is £4.19. I have a love hate relationship with my eyebrows, they are quite large and I give them minimal grooming, I feel like this product could tidy them up a bit without me having to keep getting them done professionally. The next product is B. Dramatic bold liquid eyeliner in black, which is £5.99. I like kohl eyeliner but I don’t feel like it’s permanent enough, I feel like this eyeliner would solve that and all that would be left is to practice my cat eye technique. The fourth product is B. Radiant under eye concealer in light, which is £3.98. I have quite prominent under eye bags due to a combination of factors so any product which can help me cover them up is a godsend. The fifth product is B. Vibrant lip and cheek colour in Alecia, which is £7.99. This product won the beauty awards last year so you know it’s good. I wouldn’t use it on my cheeks as I feel it’s too bright and I chose this sort of pinky coral colour because it’s not like any other colours I have in my make-up bag. I need to stop wearing red lipstick so much! The last make-up product I’d like to buy is a nail polish, it’s from Barry M’s aquarium range and it’s the Pacific shade. This is such a gorgeous tone of blue and I like the gold scales on the top of the bottle. It retails at £3.99. The next two products are perfumes, at the moment I am just wearing body sprays from Superdrug and I feel like a perfume might make me feel like an adult again. The first is from Dolma Perfumes and it’s the Keltina scent which is a floral rose, and I love roses and floral scents. It comes in a variety of sizes but I think i’d start of with the trial size which is £2.75, and I’d probably try some other perfumes from their range before buying a full size. The prices for their full sized bottles (7ml to 32ml) range from £10.85 to £19.95 so that’s fairly reasonable. The second perfume is from Lush, and I actually tried this when I visited my local store. It stayed all day and smelt so amazing. 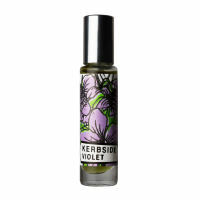 It’s the kerbside violet and is £18 for 10ml, or £36 for 30ml, so it’s a bit more expensive than Dolma. All of these products come from Lush because everyone keeps posting Lush hauls which are making me jealous. The first thing I’d like to try is I love juicy, which is a liquid shampoo which is £5.50 for a 100g package. It sounds fruity and delicious, and I think it would be a great product for my hair, which tends to be greasy. Here’s a link to the product. The next product is a shower jelly, don’t rain on my parade. This is £4.75 for a 100g package. Blueberry, vanilla and violet sounds like a heavenly combination to me and I really need this in my life. Here’s a link. The third product I’d really like to use is their cupcake mask, which is £6.50 for 75g. A mud mask with cocoa powder and cocoa butter, yum! This sounds like it would smell amazing while you are waiting for it to do its magic, and it is great for oily skin and breakouts, so that would be good for me right now. Here’s a link for you. The next product is a shower smoothie, Turkish delight roulade, which is £8.50 for 100g. Rich with roses and cocoa butter this product looks really creamy and moisturising. I just love roses so this would be so lovely for a relaxing and nourishing shower. I’m posting an image of this product because you can see the product properly, even if it looks a little like a slice of ham. The fifth product I’d like to try is a skin lotion, I don’t use a lot of lotion and I think this product would get me excited about moisturising. 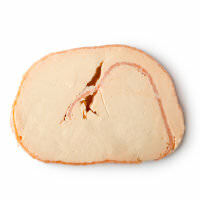 It’s sympathy for the skin, which is £5.95 for 100g. This lotion is packed with vitamin rich bananas and I imagine that the smell is wonderful. Here’s a link. The last product from this section is a shower scrub called candy floss, which is £12.50 for 400g. This is an interesting product as it seems to come as a powder in a box, something I have never experienced before. Sugar and vanilla ensure you will have a sweet shower experience. Here’s the link. The last section of this post is shoes, I don’t have enough shoes and basically switch between one pair of boots and one pair of flats depending on the weather. These are all from ModCloth, an American site. The first pair I picked were ‘how the Southwest was fun’ sneakers, these look like beautiful casual shoes for a sunday stroll. They are $49.99. The second pair I chose were the Oxford comment heels in maroon, which are $73.99. I love brogue style shoes and don’t wear enough heels, these look lovely and vintage, and also look quite comfortable. The third pair I desired were the ‘up your alley cat’ flats in stripes. These red and white striped shoes with black cat details are quirky and so cute! These are $59.99. The last pair are so adorable it’s ridiculous, I have posted them on Twitter before and I won’t give up until I own them, although I have no idea what I would wear them with, or where I would wear them. They are the creature presentation flats in unicorn. They are bright pink flats with unicorn faces on the toes and are $39.99, so the cheapest of my selection. Well that is a small selection of my rather large wishlist, I hope you enjoyed (if you made it to the end!) and maybe even found something you’d like to try or buy yourself. I’m pretty sure I need those unicorn flats in my life asap. Too stinkin’ cute!